Johnston Street, Fitzroy, c1973 Photograph: Committee for Urban Action (CUA), State Library of Victoria Picture Collection. 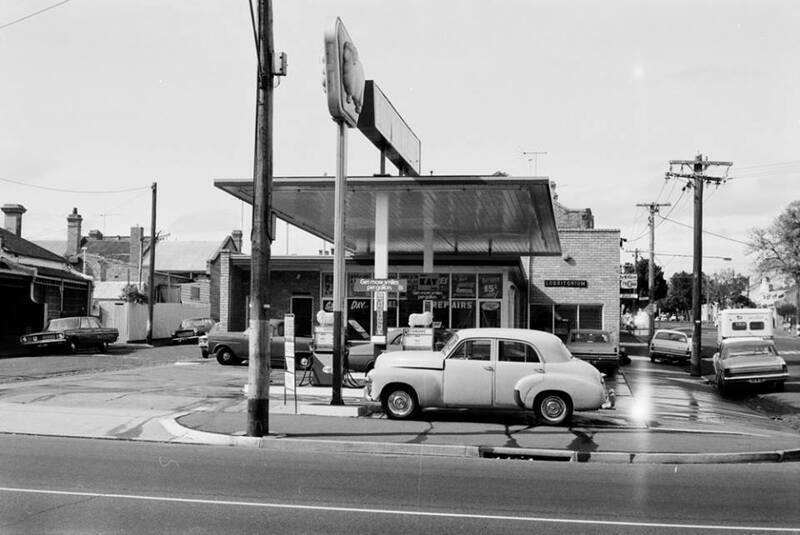 This photograph of the Golden Fleece Service Station in Johnston Street, between George and Elliot Streets, is one of a series of photographs by the Committee for Urban Action (CUA) of Fitzroy in the 1970s, prior to its gentrification. The chain of Golden Fleece Service Stations was established by H C Sleigh & Company in 1913. It was the first of the one-brand service stations in Australia. Prior to its establishment, service stations sold various brands of petrol. Golden Fleece is derived in name from the golden-haired winged ram in Greek mythology. This logo pre-dates the flying horse signage of Pegasus of its competitor Mobil. However to most Australians the Golden Fleece had associations more with the country’s wool industry. 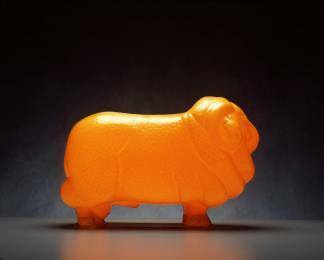 A photograph of an illuminated plastic Golden Fleece ram, which typically adorned the top of the company’s petrol bowsers, is shown above. Visible in the photograph of this Fitzroy service station is its ‘Lubritorium’ where cars received a grease and oil change; and signage with the slogan “Get more smiles per gallon”, which demonstrate the service-orientated nature of petrol stations of this era, where a driveway attendant filled your car with petrol, checked the oil, and even cleaned your car’s windscreen. Another sign advertises Kay Rent A Car, one of the major car rental companies of this time. Kay Rent A Car was established in Melbourne in 1956 for the Olympic Games. Golden Fleece was bought by Caltex in 1981, and its service stations re-branded under the latter name. The former Golden Fleece Service Station in Fitzroy still exists, but is now used as a veterinary clinic. Google Streetview of the site shows the driveway and its canopy is still extent. What appears to be hipsters, looking at their phones, are shown in the Google Streetview image sitting in what was formerly the Lubritorium of this former Golden Fleece Service Station. Fitzroy Golden Fleece Service Station, Committee for Urban Action (CUA), State Library of Victoria Picture Collection.